Some firearms have had such a great impact on global events that their very silhouette is synonymous with global events. 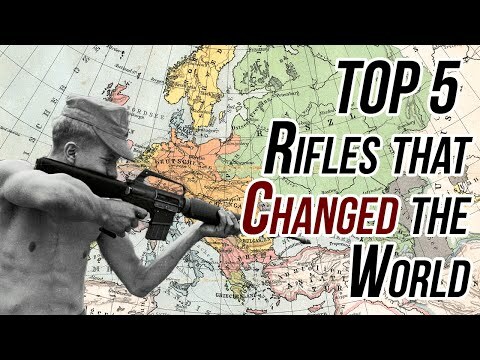 This is a list of 5 truly revolutionary firearms that have helped shape the world as we know it today. In 1887 the French Army started using the Lebel Rifle, an 8mm bolt action infantry rifle, it was the first military firearm that used smokeless powder ammunition. The Mauser 98 is a German bolt action rifle that uses a 5 round internal clip-loaded magazine. The Germans used the rifle from 1898 to 1935 when it was replaced by the Karabiner 98k. The distinct feature of the Gewehr 98 was the controlled-feed bolt-action. M1 Garand rifle, USA. Caliber .30-06. From the collections of Armémuseum (Swedish Army Museum), Stockholm. The M1 Garand rifle is a 0.30 caliber semi-automatic US rifle designed in 1928 by Canadian-American firearms designer John Garand. It was in service as the standard US service rifle from 1936 to 1957. Thousands of these rifles were also lent or supplied to the allies of United States as foreign aid. The M1 was still in use in large numbers until 1976 and today it is mainly used for drill purposes or by collectors. From 1936 to 1957 and in the 1980s total 6.25 million M1 Garand rifles were produced and per unit cost was $85 during WWII. The AK-47, often known as the Kalashnikov after the man who developed it, was a Russian design developed in 1945, the last year of the war. It was modeled on the German Sturmgewehr 14 assault rifle, which impressed the Soviets. It was first tested in 1946 and introduced into the Soviet Army in 1948. It is a gas -operated 7.62×39mm assault rifle which can operate as an automatic or semi-automatic weapon. It has a 30 round magazine and an effective change of 350m (380yd). To this day the AK-47 remains the most popular assault rifle in the world on account of its reliability, low cost, availability, and simplicity. In 2004, 100 million Kalashnikovs were in service, out of a total of 500 million firearms throughout the world. The M16 is the American equivalent. It is a 5.56×45mm rifle. It is a development of the Armalite AR-15 rifle which had been produced in the 1950s. In 1969 it became the standard firearm of the U.S. Army. It has a magazine of 20 rounds. Like the AK-47 it can be automatic or semi-automatic. It has an effective range of 550m (601yd). Also like the AK-47, it is used by many other military forces in the world. Around 8 million M16’s are produced worldwide. There are more M16s than any other 5.56 mm caliber guns.